I walked around a campground on this May Victoria Day (Canada) long weekend and noticed a number of new RVer’s enjoying their first weekend in their "new to them” RV. I remember many years ago when on this same weekend, we selected a pop-up trailer over a tent as our recreation mode and a few years later on this long weekend, we took our maiden trip in our first Class C RV. In Canada, it seems that this weekend is the one to officially open the camping season. This year it is a cool and sometimes wet one. Thankfully the weather is clearing but a cold North wind is still blowing. On my walk I noticed a few campers that are likely unaware of how unsafe their RVing experience might be. As the trend to start RVing earlier in life grows, younger RVers are buying their first RV, often recalling those rigs that their parents or grandparents enjoyed. These RV’s offer the space for young families and their gear and are relatively inexpensive, making the leap to RVing more affordable than purchasing a new Class C. This may mean they are buying Class A coaches produced in the mid-1980’s to late 1990’s. A lot has changed over the ensuing 20-30 years, including the propensity to tow the family car which when these RV’s were produced, really did not occur. At that time, the rear hitch receiver was used to haul bicycles, a small utility trailer or a small boat trailer. The hitch ratings were 1,000 to 1,500 pounds (lbs.) (454 to 682kg) with the odd one rated to tow 2,000 lbs (909kg.). These coaches were built on chassis that were also not designed for carrying extra weight and many were too short for the coaches that were built on them. The RV makers regularly added chassis extensions that might be 4” (10cm) in height welded to the factory frame (that may have been as small as 6” (15cm)). These extensions almost exclusively carried the rear bedrooms in these coaches. The Towing Hitch Receiver was attached to these chassis extensions and given all of the above factors were not capable of carrying substantial weight. Fast forward to today and almost every RV with a hitch receiver has 3,500 to 5,000 lbs (1,591 to 2,273kg) of weight carrying capacity (often more on diesel powered coaches), and most tow a vehicle behind. It may seem strange today, but when I started RVing, cars were rarely towed behind any RV except the big buses. As the trend to towing vehicles grew, the popular towed cars were the light weight Saturn’s, Ford Escorts as well as the mini trucks of the day. These vehicles weighed in at 1,800 to 2,800 lbs (818 to 1,273 kg). Braking systems were new inventions and most RVers did not use them (although they should have). Now back to my walk. I saw a mid ‘80’s Winnebago Adventurer built on a Chevrolet P30 chassis (as evidenced by its 19” narrow width tires). The towing capacity of this chassis was 1,500 lbs (682kg). The tow "car” was a relatively new Jeep Grand Cherokee (estimated to weigh 4,000lbs (1,818kg)). Based on my knowledge, this is a very unsafe combination. Adding further to the safety concern is the towed Jeep does not appear to have a braking system, if the lack of a breakaway switch is any indication. For those contemplating buying a pre-owned RV, check the GCWR and the GVWR which is listed on a label installed on the wall by the Driver’s seat and often in these coaches on the inner side of one of the cabinet doors or closet. This label gives the GVWR which is the total capacity for the weight of the coach, all passengers and all the "stuff” taken along. Since these labels were prepared under the older guidelines they calculated the estimated capacity of the coach with all tanks empty, nothing inside and without passenger weights. My experience showed that many of these coaches had a total capacity of 1,000 to 1,500 lbs (454 to 682kg). After adding a family with their "stuff” fuel, propane and some water, most coaches of that vintage were up to capacity. If they were not, then what ever extra capacity rarely allowed anything but a light weight tow car to be towed. The GCWR adds the weight of the "trailer” to the GVWR and as you can guess, there was little if any capacity for a tow car. This information is often not taken into account by the novice RVer and especially when buying without the aid of a knowledgeable dealer. The consideration is focussed on the RV: Its condition, suitability for the family and price, but rarely is the ability to tow brought into the equation. "There is a hitch receiver so we can tow” is the limit of the thoughts on it. 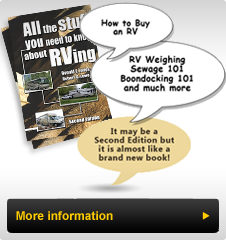 I’ve covered having an RV weighed in some of my TechTips (see #11) as well as a chapter in our book (All the Stuff You Need to Know about RVing). Suffice it is to say that even when within the RV’s GVWR capacity it is not unusual in this vintage of coach, to find one (or more) wheel position(s) over the allowed weight, even if the coach is within the overall capacity. Certainly all RV Chassis makers recommend (require) a tow vehicle braking system if you are towing a trailer of over 1,000 to 1,500 lbs (454 to 682kg). Add safety to the list of MUST HAVE’s this summer season, your life and those of others may depend upon it!